To travel Russia, Visa is needed in both cases of sightseeing and business. You can not enter in Sakhalin with electronic VISA. To obtain Russian Visa, Invitation letter is needed. UTS Air Service can arrange invitation letters, and make a Russian Visa application process. Tourists can be allowed to stay in Russia until 30 days. It takes two or three days to arrange an invitation letter. *The validity term of the Passport should be no less then 6 month from the date of expiration of the Russian visa. Applicant’s address, phone number, place of work, address and phone number. Visit frequency in the past. The last day of entry and departure. ** オリジナルは送料込み Sometimes it takes time to get invitation depends on situation of organization which are issued invitation. Applicant’s original or color scanned passport. Applicant’s address, phone number, place of work, post, address and phone number. Cities that applicant plan to visit/Period of staying in Russia. 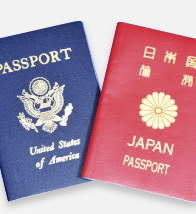 Consular charges will be added to applicants of non-Japanese citizenship. Time of visa application is different between Russian Embassy in Tokyo and Russian Consulate in Sapporo. 3. In case of application with request forms, multiple visa is more than 10 days, single or duble visa is more than 5 days. * The validity term of the Passport should be no less then 6 month from the date of expiration of the Russian visa and the Passport should contain at least two blank pages.Medical certificate of non-AIDS may be necessary at the time of the application of the visa to stay more than three months.